Robert M. Thorson is Professor of Geology at the University of Connecticut where he juggles teaching, scholarship, and service within the Center for Integrative Geosciences, the Honors Program, the American Studies Program, the Department of Ecology & Evolutionary Biology, and the Department of Anthropology. Originally an Alaskan field geologist, he gradually metamorphosed into a New England professor, author, speaker, journalist, and consultant. In 2003 he began freelancing newspaper and magazine pieces, and began coordinating the Stone Wall Initiative an online resource/blog for historic landscape conservation within the Connecticut State Museum of Natural History. Between 2004 and 2018, he was a regular opinion columnist for the Hartford Courant, the state’s flagship, capitol-city daily, For his scholarship in environmental history, in 2018 he was elected to the American Antiquarian Association in 2018. For his leadership in geosciences, in 2014 he was elected a fellow of the Geological Society of America. He’s also garnered awards for teaching, journalism, and writing. Visiting scholarly appointments include Harvard University (American Studies), Universidad Tecnica de Santa Maria, Valparaiso, Chile (Civil Engineering), Dartmouth College (Geography) and Yale University (History). The last three of his seven books involve Thoreau Studies: The Guide To Walden Pond was published in March 2018 by Houghton Mifflin Harcourt. 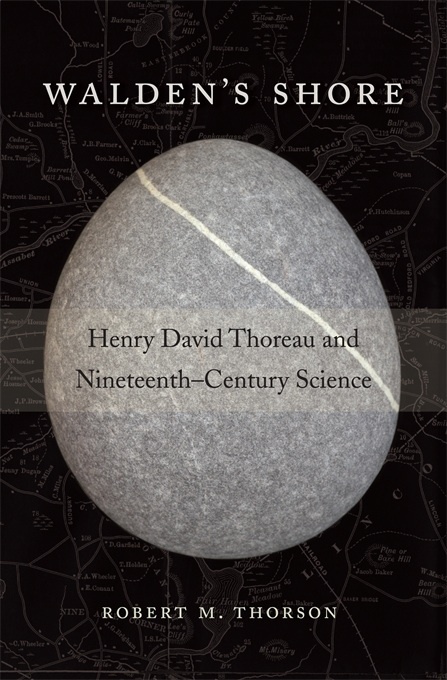 The Boatman: Henry David Thoreau’s River Years (2017) and Walden’s Shore: Henry David Thoreau and Nineteenth Century Science (2014) were published Harvard University Press. Additional Thoreau publications include the invited essays “Physical Science” in Thoreau in Context (Cambridge, 2017), “The Maine Woods Rhomboid” in Rediscovering the Maine Woods (UMass, forthcoming), and articles for the Thoreau Society Bulletin. Ph.D. 1979, Geology, University of Washington, Seattle, WA. — M.S. 1975, Geology, University of Alaska Fairbanks, AK. — B.S. 1973, Earth Science Teaching, Bemidji State College, Bemidji, MN. Permanent: Professor, University of Connecticut (1984-2018). Formerly Associate Professor, University of Alaska (1980-1984, Fairbanks), and Assistant Professor, University of Wisconsin (1979, Oshkosh). Visiting : Harvard University (American Studies 2013), Universidad Technica Santa Maria (Chile; American Studies, 1998), Dartmouth College (Geography, 1992), Yale University (History, 1991). Seven published non-fiction books (2003-2018), and four scholarly monographs. The Guide to Walden Pond (Houghton Mifflin Harcourt, 2018), The Boatman (Harvard University Press, 2017), Walden’s Shore (Harvard University Press, 2014), Beyond Walden (Bloomsbury/Walker, 2009), Exploring Stone Walls (Walker, 2005), Stone by Stone (Walker, 2003), Stone Wall Secrets (co-authored with Kristine Thorson, Tilbury House, 1998). ~450 essays and opinion columns, mostly for the Hartford Courant (2003-2018). Forensic history, museum design, boundary disputes, land use issues, stone walls. Hundreds of talks, workshops, professional trainings, and field trips, mostly for nonprofit associations and government agencies, usually on environmental history. Solo and shared awards for nonfiction books, journalism, teaching, and scientific research. Highlights include being an elected Fellow of the Geological Society of America and recipient of the Connecticut Book Award for nonfiction. Photo: Cover of Walden’s Shore, my most in-depth scholarly work, 421 pages of material vetted by Harvard University Press and widely reviewed by specialists.